Umbrella Studios: "An independent film that is very low in budget, however extremely high in its concepts and vision". Thank you for taking the time out, once again to read our blog. It is much appreciated and we hope you are gaining more insight into the journey we're on and ultimately what we're hoping to achieve. Since the last time we touched base with you, we have been unbelievably busy non stop. Unshaven beards, sleepless nights, bags under the eyes, university course work, the fundraising evening, second draft, scheduling for principle photography, interviewing people for the Broken Souls production team, communicating with the actors, sound crew, camera crew and producers. Attending conferences and networking events where we've shared our vision and our experimental Broken Souls pieces with diverse audiences. But then we think to ourselves, we got into it because we have a passion and serious love for what we do. So right now, we're back in Birmingham and are preparing for our full cast read through and rehearsal process. 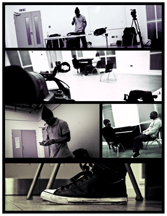 Principle photography is just around the corner and all our actors and crew are very excited. The main things for us right now is that everyone see's and treats Broken Souls as their own and believe in the story 100 per cent. Their willingness, attitudes and commitments towards the project is amazingly refreshing and reminds us every day that God is behind us and that we can't lose hope.